I recently spent time in Germany-mostly Berlin, with a couple of days in Munich–where I visited Jewish museums, the Topography of Terror, Holocaust memorials, artists commemorations of the Holocaust (including the Places of Remembrance and stolpersteins), and read lots of books and commentaries (including here, here, here and here). Trying to comprehend and process my thoughts and emotions about the dichotomy of Germany’s history and the present day was challenging and hard to reconcile, especially against the backdrop of Berlin: a modern, colorful, vibrant, fun, flourishing, art-filled city with a sizable immigrant community from around the globe and a small Jewish community. 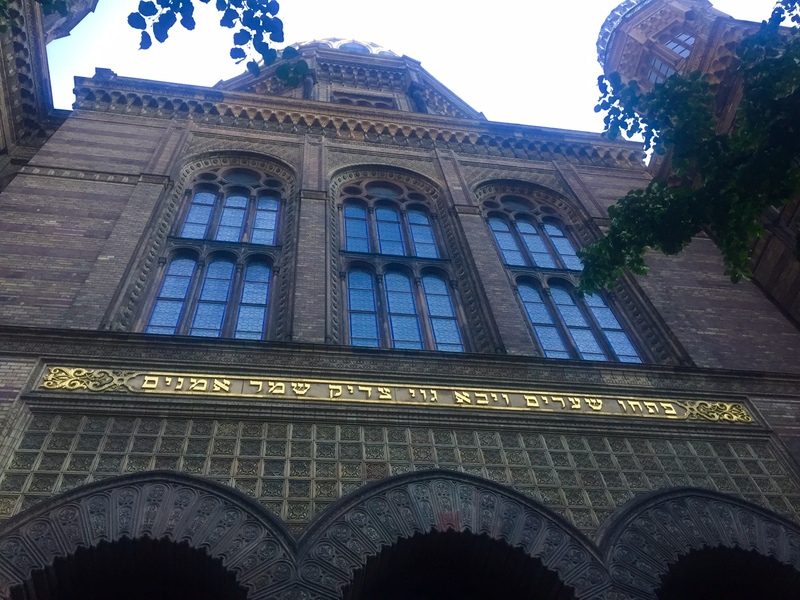 There are now four yeshivot and 13 synagogues in Berlin, I heard Hebrew spoken on the street a few times, and had dinner with several Israeli artists living in Berlin. The historic Neue Synagogue, Berlin. I experienced a fraction of Germany’s attempts to address the nation’s past but had become almost detached and overwhelmed by all I’d taken in. 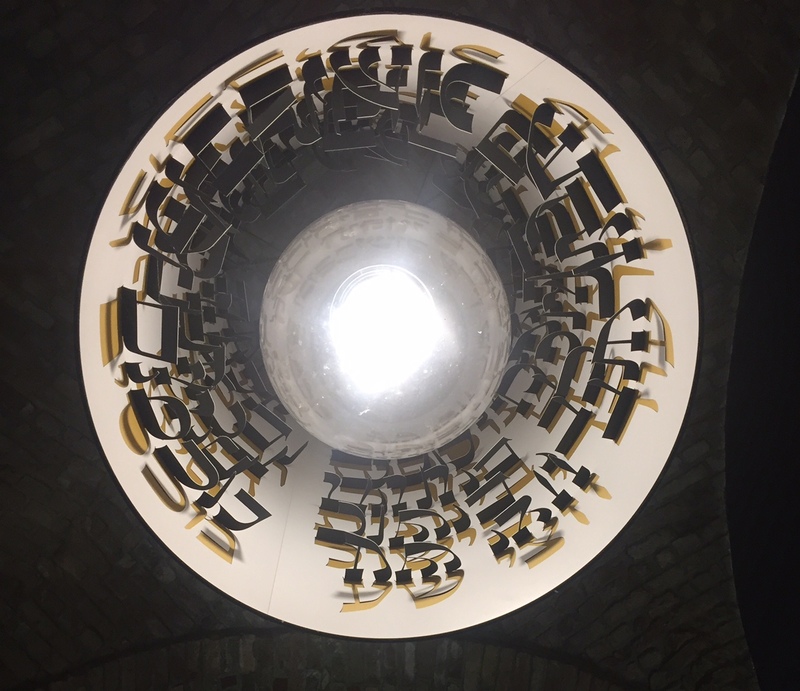 Shabbat brought everything together and gave meaning to the facts, sights and images, connecting me with people as a witness of the complicated, tragic, and redemptive aspects of the Holocaust. I went to a synagogue for Kabbalat Shabbat whose rabbi had been able to leave Germany in 1940 and became the rabbi of my father’s family’s synagogue in Los Angeles. It was amazing to be there for Kabbalat Shabbat and witnessed the return of a siddur, by the grandchildren of a man who had taken it when he fled Nazi Germany. The following morning at a different synagogue, a congregant shared his story. His father was a Nazi. In response, he renounced his family and chose to live his life as a Jew. He said that he realized that he could not ever change the mindset of his parent’s generation in Germany but could of young people and devoted his life to teaching about the Holocaust. One afternoon, I stopped at a vegan cafe for a delicious slice of plum cake (called pflaumenkuchen or zwetschgenkuchen in German and flomenkikhen in Yiddish). While enjoying it, I saw a huge sign in the cafe window saying “No place for Nazis”. It was jarring and shocking. I thought Berlin was different–even if there are still active Nazis in Germany, I couldn’t imagine that they would be in Berlin, with all of the immigrants, artists and free-wheeling society. 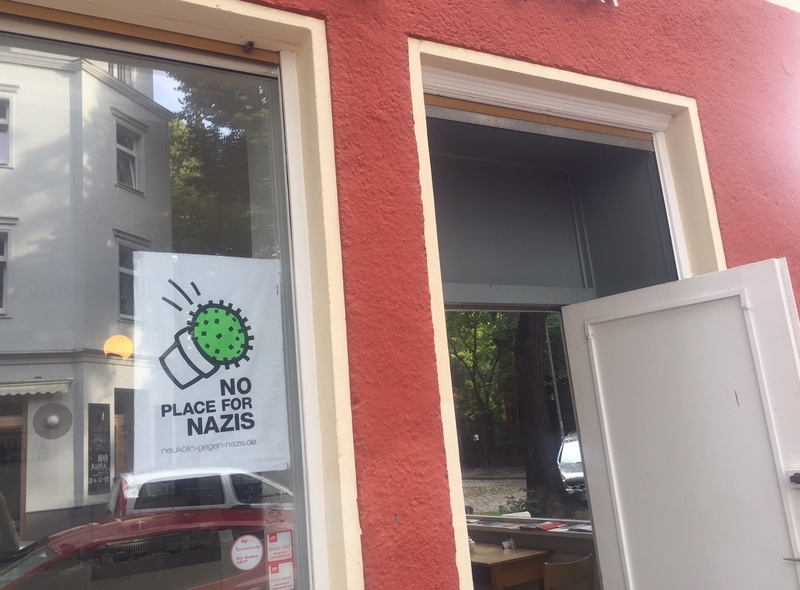 The cafe owner explained to me about attacks on bookshops in the neighborhood and her sign was part of a larger organization fighting against Nazis in Berlin. My encounter with the cafe owner was a powerful moment that I felt showed the best of Berlin, which I generally experienced: people are speaking out against Nazis, Israeli artists are comfortably living there, and Jews celebrate Shabbat. Neesh Noosh is a Jewish food blog, and I struggled with including a recipe in this post. I chose plum cake because it reminds me of one my grandmother used to make and I was touched by the cafe owner’s passionate work against Nazis in Berlin today. While researching plum cake recipes, I learned that it is a common German-Jewish dessert (with many variations on its name) and is even dreamed of in a Yiddish folktale, The Dream Cake of Chelm. This recipe is from Vegalicious, with a few minor changes. It is made with sugar, but it’s not an overly sweet cake. Stir in non-dairy milk, 5 tbs. melted vegan margarine, vanilla, yeast and 1/2 teaspoon cinnamon. Cover dough with the plum wedges (set them slightly “standing up”) . Brush plums with remaining tbs. of melted vegan margarine. Sprinkle 1/4 cup sugar mixed with remaining 1 teaspoon cinnamon over top of cake. Bake at 375~ 30 to 40 min, or until center tests done. 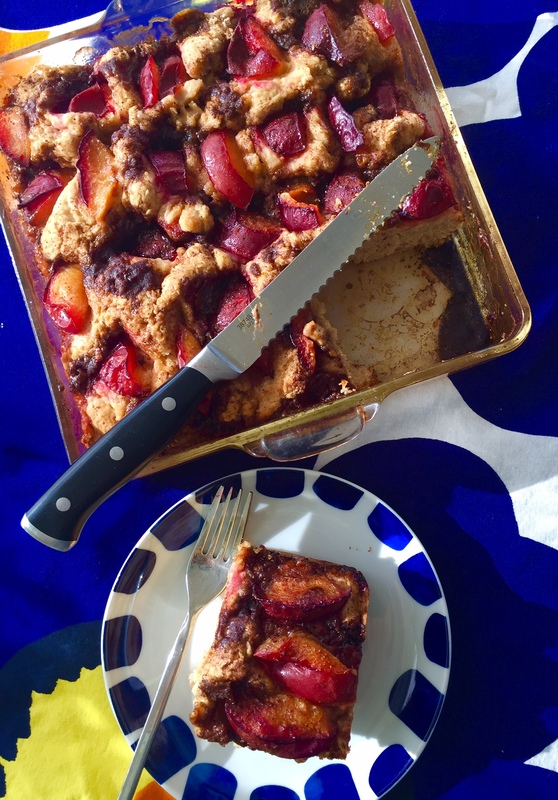 This entry was posted in Dessert, Fruit, Travel and tagged baking, Berlin, flomenkikhen, Germany, pflaumenkuchen, plum cake., Shabbat, vegan, Yiddish, zwetschgenkuchen by Sarah Newman. Bookmark the permalink. Yes-It has an Extremely vibrant community of artists and you feel their presence. Thank you for sharing all these experiences, Sarah – I was actually just dreaming of making plum cake! Thanks and I’m glad you enjoyed it. What an intense experience, you would need a quiet afternoon in a cafe eating sweet plum cake just to balance out all that you saw and did there. I tried this recipe with organic plums from my CSA fruit share and it was delicious. Thanks and I’m glad you were able to make and enjoy the cake, too!